Today is "Laetare" Sunday, which means "rejoice." And I rejoiced! But I have to admit that I began my rejoicing a little bit early. I rejoiced so much last night that this morning after 9 a.m. Mass when I hit the church coffee hour, I was in such a hurry to scarf that coffee down that I burned my mouth on it. And not only that, but when someone made the mistake of trying to talk to me I distractedly dumped about a pound of Cremora into my cup. Then I drank it anyway! Let us not dwell on that. Let us dwell rather on what I was drinking last night, the reason I was so desperate for the coffee. Last night we went to a beautiful dinner party where our friend Art made cocktails called Blood and Sand. That is a drink named after a 1922 Rudolph Valentino movie. You will need 2 parts Scotch to 1 part sweet vermouth, Cherry Heering and the juice of a blood orange. The drink is dark orange, the color of a sunset. I wanted to take a picture but zut alors, I had forgotten my camera. Howard could have taken one but he had a cold and was out of it. I should not have brought Howard to this party, I will say that. If Art or any of our other friends there comes down with this bug Howard has I would never forgive myself. I encouraged him to go. And he went, because when I gave him the option of staying home of course he said no, he wanted to go. Because he knows that otherwise we all would have talked about him behind his back. Over our Blood and Sands! ... does not measure up. Sorry. There was one person on earth who viewed remakes with the distaste that I do and that was Leonard Pennario. We had that in common. We established that the night we first met. 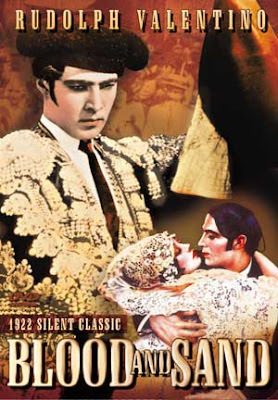 Here is a picture of Rudolph Valentino in the original "Blood and Sand." Here is a shot from the movie with Rudolph Valentino and friend. On the Music Critic blog we once explored the work of Valentino in "The Sheik," which co-starred the daughter of the pianist Leopold Godowsky. It is a steamy post! You may revisit it here. 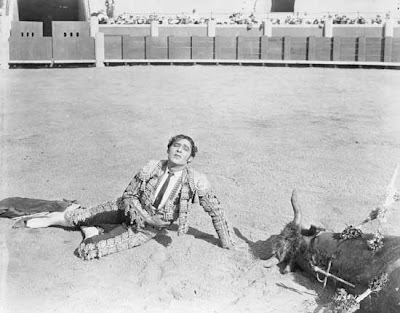 But as the Wall Street Journal reported, in the story that inspired Art to re-create the drink, Valentino was more proud of his role in "Blood and Sand," in which he plays a bullfighter. Such a funny, brief moment in time, when they were making silent movies. That era was gone in a flash. Like my Blood and Sand last night. And the Blood and Sand that I drank after that. 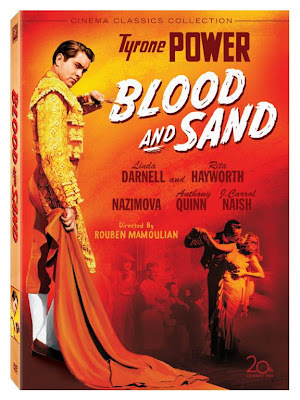 Here is a clip of Rudolph Valentino in action in "Blood and Sand." Here is a quote from it I love: "Senor President, I toast you and dedicate this bull to your honor!" To whom shall I dedicate my bull? There is no end to it. That is for sure! I think Blood and Sand cocktails are great....glad you like them too. I am sure I could dedicate my own "bull" also!! !